Of all the old houses in Scotland I've visited, I think my favourite might be Traquhair. 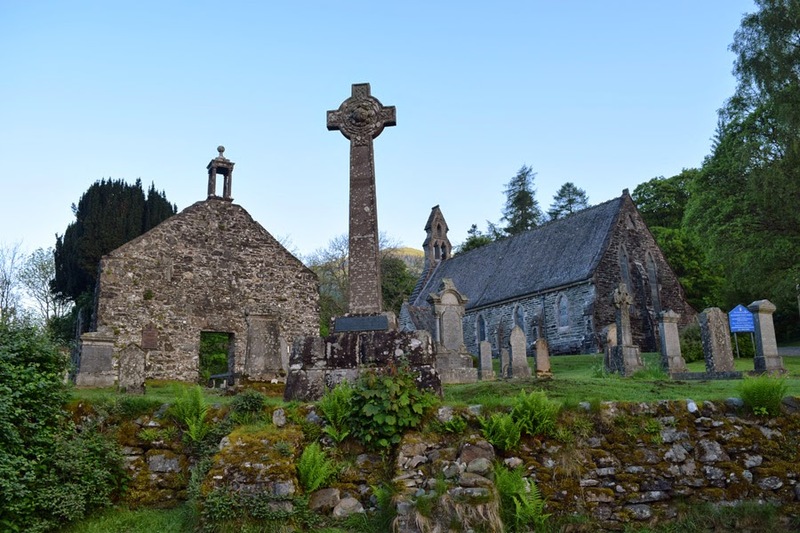 It claims to be the oldest continuously inhabited house in Scotland (since at least 1107, maybe a 150 or so years earlier, if you're asking), the name being so old it is not English or Gaelic, but Old Welsh, the dominant language in the area before the Angles arrived in the 6th and 7th centuries. It sits in mature trees and parkland where the Quair Water meets the River Tweed, nestled - but not crowded - by steep Borders hills. 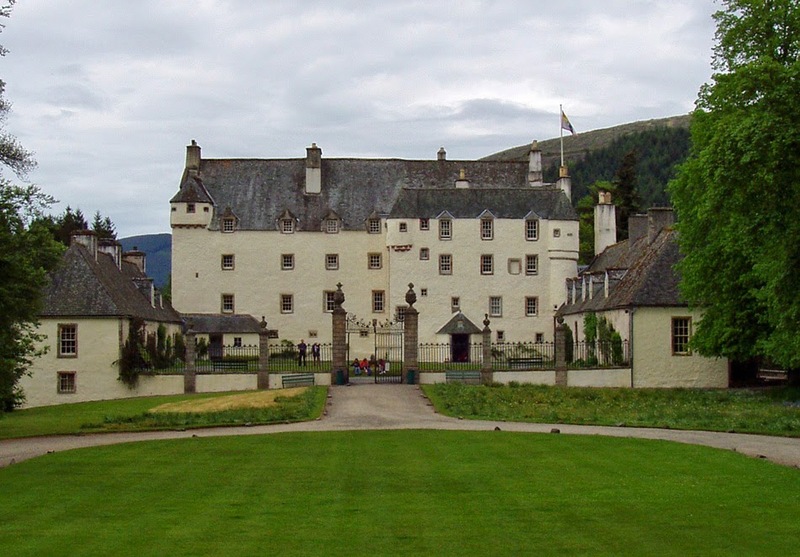 For centuries it was home to the Stewart family, today the Maxwell-Stuarts, an unostentatiously Catholic family. Whilst this is of only passing interest today, in centuries past the Stuarts had to exercise great discretion to avoid the suspicion of Protestant authorities. The old faith was easier for the landed gentry to retain than the common tenant, as they could afford to hire priests, worship behind closed doors, and were not subject to the same level of intrusiveness into private affairs - and in the Borders and Northumbria, Catholicism remained common amongst major landowners. Only when the law changed in 1829 were the Stuarts able to publicly build a chapel. Their support of the old ways included espousing the Jacobite cause. 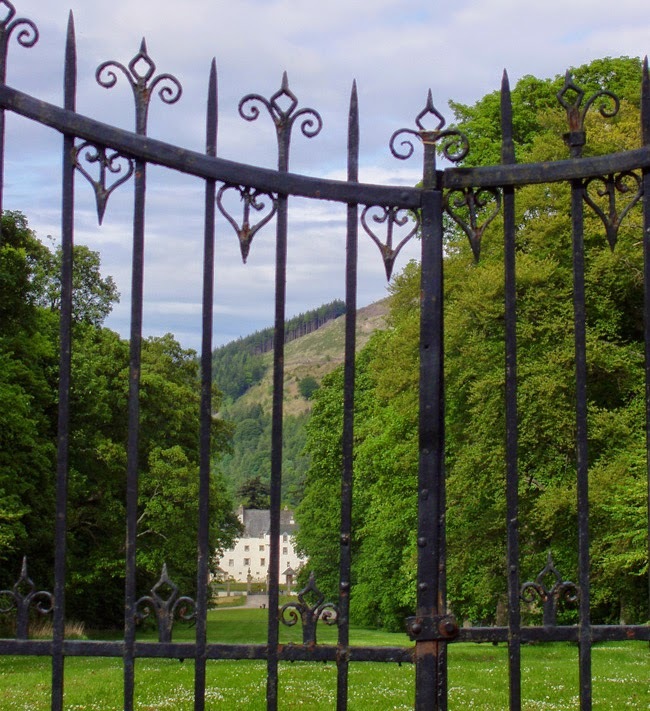 Legend has it that in 1745, as the 5th Earl closed his new gates behind Bonnie Prince Charlie - a guest on his march to Derby - he declared that he would not open them again until a Stuart sat on the British throne. 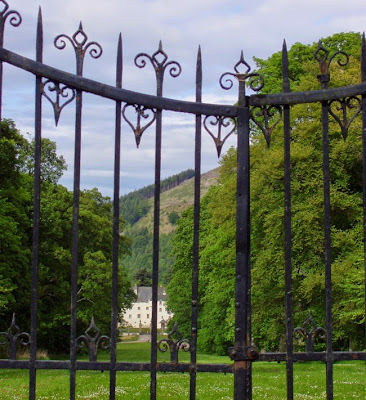 These Bear Gates remain closed to this day - and ever since, Traquhair has been accessed via a side entrance. I was last at Traquhair in March for the Deerstalker, a muddy hill-and-obstacle night race where the wearing of tweed is encouraged. But the most tangible souvenir brought home was not Tweedside mud, but a couple of bottles of superlative Traquhair Ale, brewed in a side building the old-fashioned way using ancient equipment found in a 1960s clearout. Founded in 1965, the Traquhair brewery must be one of the oldest existing microbreweries in the UK - if not the world. It was a pleasure last night to finally see a friend's band, the Just Joans. I'd meant to see them for some time. As we chatted afterwards four glitter-faced, barefoot young women took to the stage. By the end of their second song I was entranced. I had the rare feeling that I was enjoying the privilege of seeing an amazing unknown band of the cusp of something big. TeenCanteen. Catch them if you can and let some sunshine into your life. 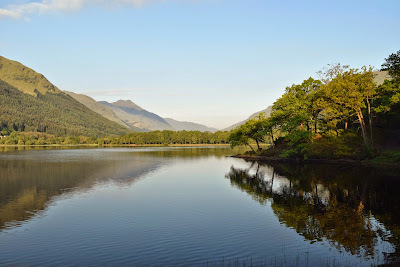 6am on a beautiful May morning at Loch Voil, probably the least visited loch in the Trossachs. Its lack of popularity is a bit of a mystery on a day like this. I love this time of day and year! Snow patches still on the hills, the greens of the landscape fresh rather than dull and jaded, long hours of daylight and almost no midges. 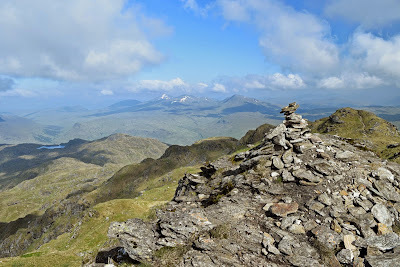 The right weather for a walk I have thought about for a couple of decades now - all the Crianlarich hills in one go. The observant amongst you will already have noticed that Loch Voil is on the wrong side of the hills for Crianlarich. But, why not? 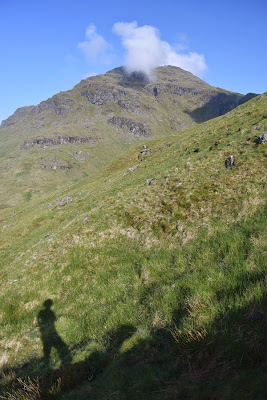 After climbing Creag Meagaidh from Glen Roy, I seem to be making a habit of going up hills by unconventional routes, and climbing the Crianlarich hills from the south, rather than the north, avoids not just the crowds but some of the boggiest approach paths in the country. I stopped at Balquhidder to see Rob Roy's grave. The walk starts at the other end of Loch Voil, at Inverlochlarig - once Rob Roy's farm. Today the farmer sells venison from the gate, or from their website http://www.inverlochlarig.com. I decided to buy some on my way back down, my walking moments filled with thoughts of the fresh venison steak I would have when I got home. The Crianlarich hills... despite their proximity to my old home, I have been up most of these only once - and all in bad weather. It was delightful now to see them on a fine day. 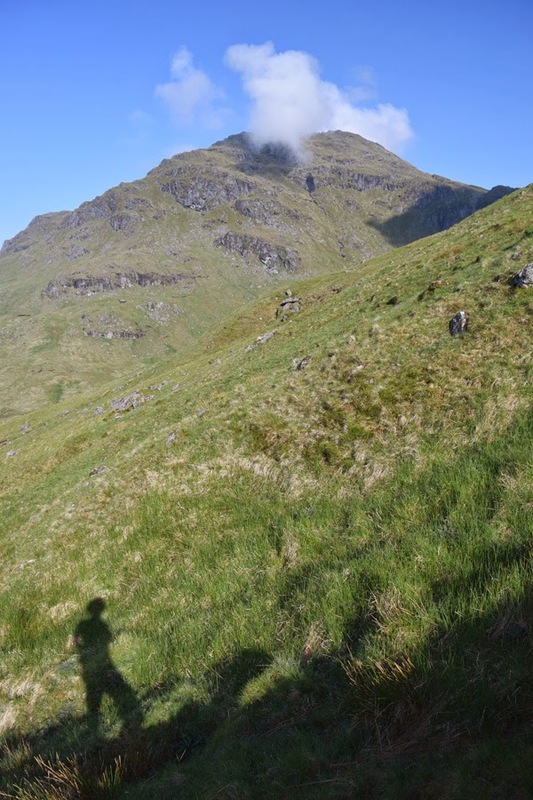 They are craggy, knobbly hills, lacking major cliff faces but not to be taken lightly - especially as my route linking five or more Munros would take me up and down very steep hillsides lacking in paths. I popped out at Beinn Chabhair's airy perch at the sort of time most folk have just arrived in work. What a place to be! My own day's work lay ahead over some big drops and reascents. I carefully picked my way down to the col, remembering that in these hills, it pays to hold your nerve as you approach apparently impossible drops - you can usually pick a way down somehow. 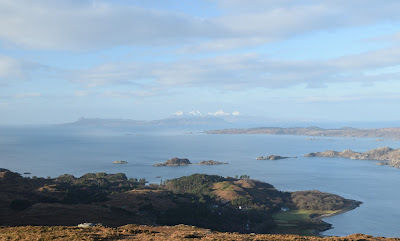 Up onto An Caisteal and over a path to Beinn a' Chroin's many-bumped summit. I was last here in 1992 in low cloud and driving rain and with so many little tops to choose from, have never been 100% sure that we reached the actual summit. I made sure of it today. But was it my faulty memory, or is there now a clear path that wasn't on this hill 22 years ago? I sat on the windless summit listening to the rushing of distant burns and was content. The drop from Beinn a'Chroin towards Beinn Tuleachain was particularly tough, a seriously off-piste route. I looked back from the bottom. There must be a word for looking back ruefully at a difficult descent to realise you just chose the worst possible route down your hill! And the way up Beinn Tuleachain was just as tough. Suddenly though, a path - linking Beinn Tuleachain and Cruach Ardrain - and, when I wondered if I would see nobody all day, half a dozen people. 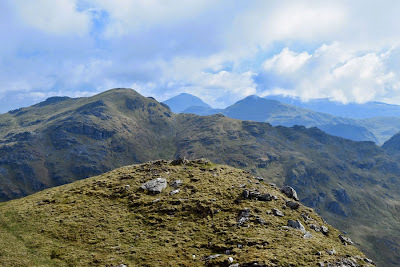 I contemplated Ben More and Stob Binnean from Beinn Tuleachain. I had thought of adding these hills too to my tally for an impressive seven Munros, 32km and 10,500ft, but Ben More is a brutal slog even without having already done five Munros, a pyramid of pain with no intrinsic interest itself. Who ever climbs Ben More twice? I would be very late home and was already tiring. Alternatively there was venison for tea. Can you guess what I did - and what would you have done?